The on balance volume (OBV) indicator was developed by a fellow named Joseph Granville in 1963. What makes OBV so useful is that it presents a more visual way to view the share price volume flow and compare it to the stock's price action. Volume should increase in the direction of the price trend, and this indicator makes it easier to make sure that is happening. If the direction of the OBV line is up, the line is bullish meaning that there is more volume on up days than on down days. A falling OBV line signals that volume is heavier on down days, and is considered to be bearish. 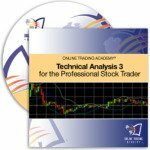 For further in-depth information on Technical Indicators, this resource contains critical information to help you learn to use stock charts and technical indicators in a clear, simple and concise manner to improve your trade entries and exits in the stock market. 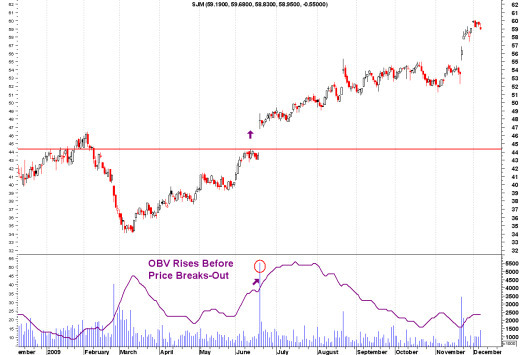 Just before a price breakout (up or down), OBV will breakout BEFORE the stock price does. That is usually an early signal that the share price will follow in the same direction. 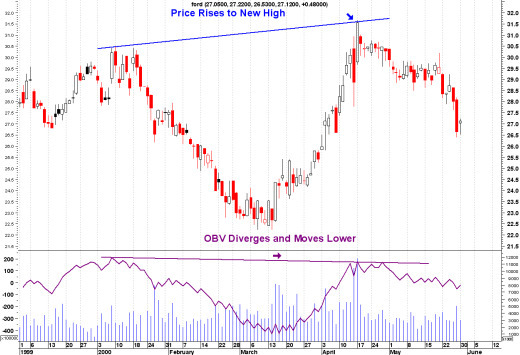 OBV gives it's strongest signals when it diverges from prices. For example, on a Double Top chart pattern, on the second top of the stock, if OBV diverges and heads lower, this is a pre-signal that the stock price is ready to fall. The opposite would be true on a Double Bottom chart pattern. Is there a specific On Balance Volume Strategy or Technique that you use, that is not described on this page? Here is your opportunity to share your On Balance Volume Indicator expertise and technique, to help and coach other newbie Stock Traders become more proficient and confident on their journey to Stock Trading Success and Profitability! Return From "On-Balance Volume" to the Home Page "Stock Market For Beginners"